These No-Bake Brownie Bites are ready in under five minutes and only require three ingredients! Sometimes the best food in life is the simplest. Like bread + butter, peanut butter + jelly, chocolate + more chocolate. 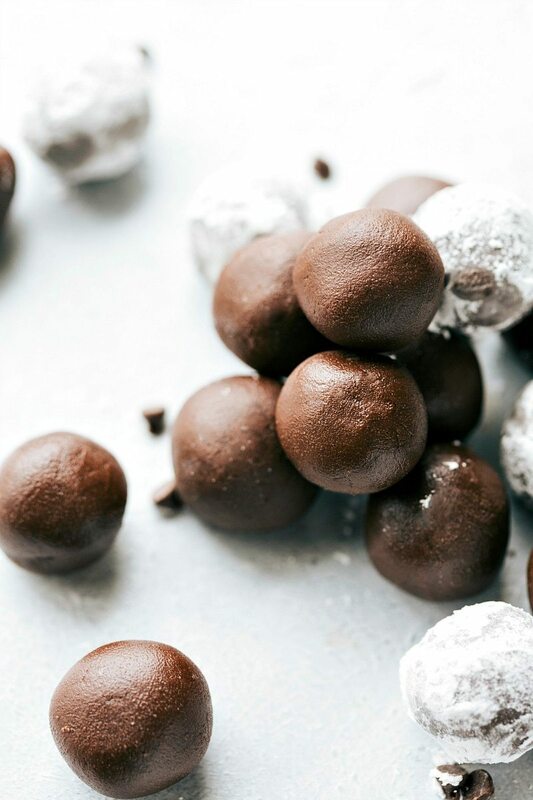 Chocolate + more chocolate in the form of no-bake brownie bites = the simplest and the best kind of food. Dessert food that is. Because this recipe is so super simple, but totally delicious. Like all the fudgy goodness of brownies in less than 5 minutes. No baking, no waiting, no oven. 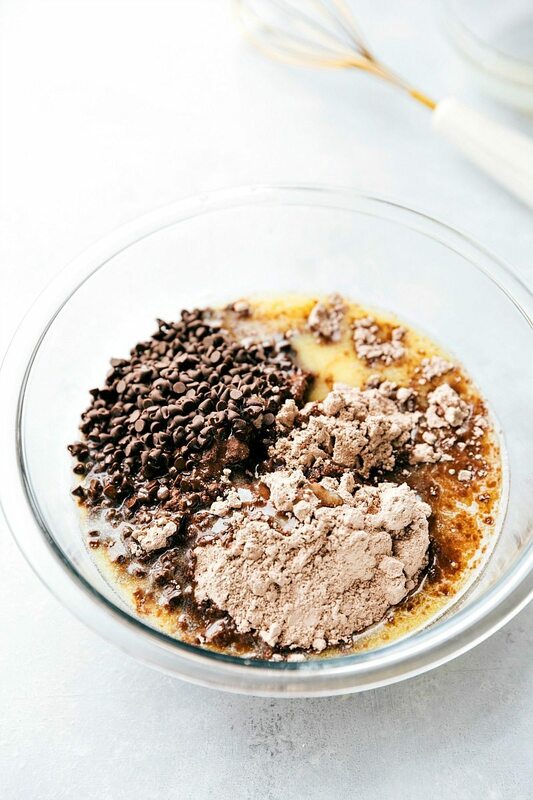 And on top of it all, this dessert requires less than 5 ingredients! 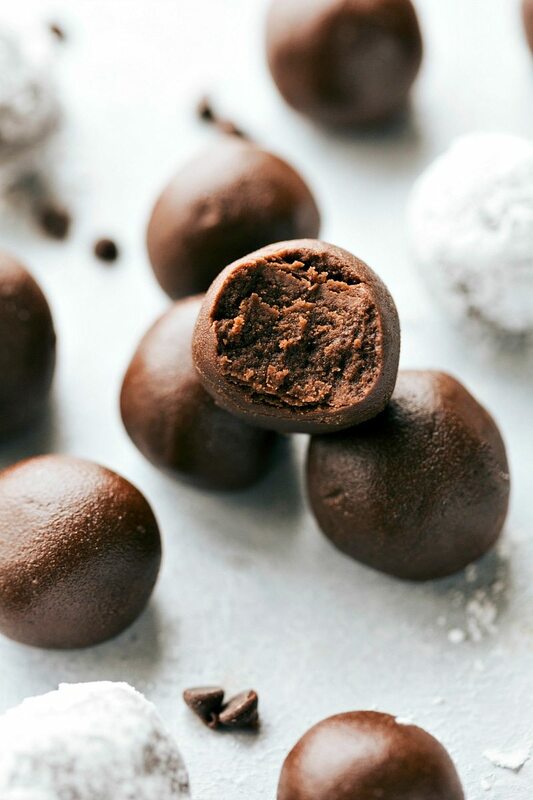 Easy 3-ingredient No Bake Brownie Bites. 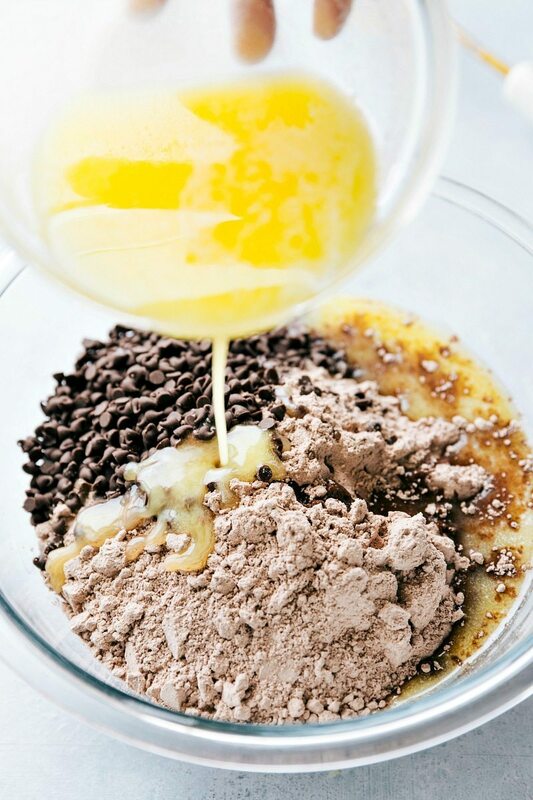 In a large bowl, combine the dry brownie mix, mini chocolate chips, and the mostly melted butter (microwave until melted, but small chunks of unmelted butter still remains). Mix with a spoon and then knead with your hands until the mixture comes together. Roll into very small bite-sized balls -- these are rich so the smaller the better! 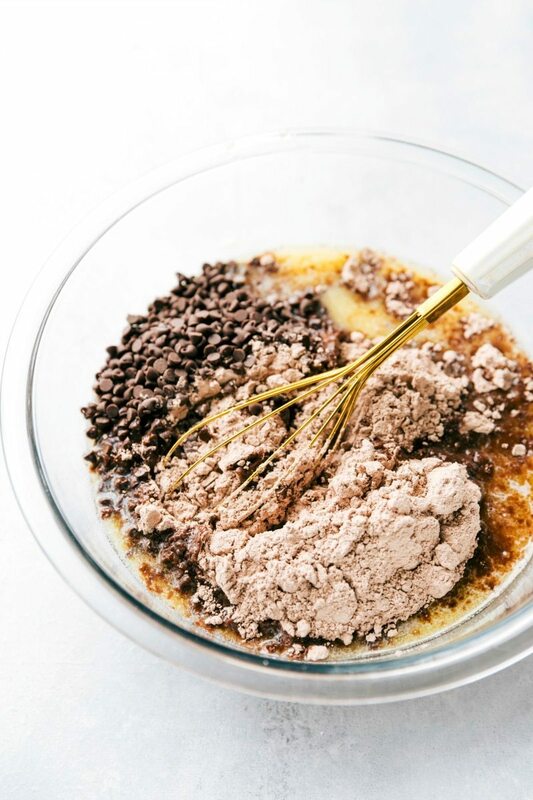 If desired, roll the balls into the dry chocolate pudding mix or powdered sugar for a pretty coating. Shake off the excess. Enjoy right-away! Store in an airtight container in the fridge for up to 1 week. *Depending on various factors (brownie mix being the main factor) you may need an additional 2-4 tablespoons butter. Add the melted butter until you can easily form balls of the mixture. Agreed, who doesn’t love easy?! And that they don’t have to set in the fridge or bake! Right on, Chelsea! Plus anything you can just pop into your mouth…hellooo 😀 Love that cute yellow dish you have…perfect brightness for the background! If I made this it would be ALL in my tummy in 2 seconds flat. My tummy loves you…but my skinny jeans..not so much. Haha! Leggings = the best! Thanks Taylor! TRIPLE CHOCOLATE without having turn on the oven?! In love with these. What!! This is too good to be true. Drooling over here. I think I need to make these ASAP. These don’t even need an excuse or an occasion. 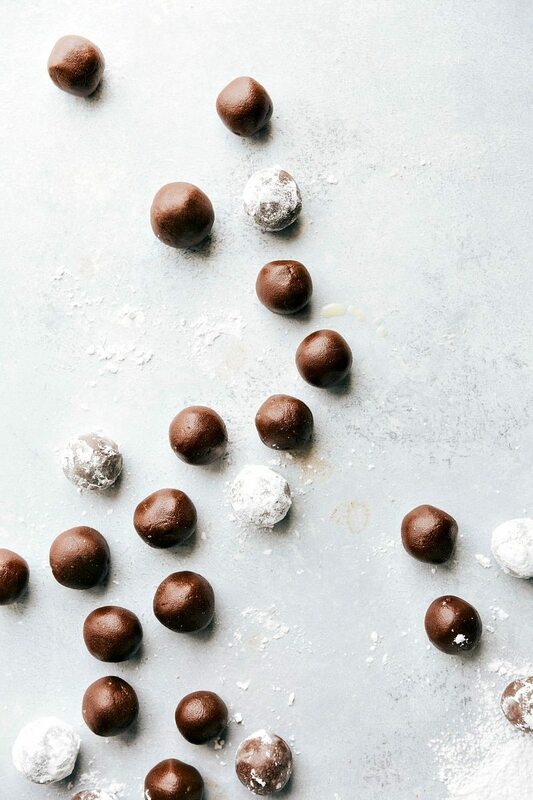 Because brownie balls are acceptable all day every day. 😉 Yummm! Love this, Chelsea! And you totally did great with the brown food photos. Love ’em! Oh my goodness these look SO yummy! Chocolate + chocolate is my favorite type of food! yes!! no bake treats are the best (and you know I’m a fan!) great post Chelsea! I love these little bites. Simple recipes that don’t require a ton of ingredients are always the best. I am pretty sure the entire bowl of dough would disappear before I’d get a chance to roll them into small bites! Haha I totally did that! Thanks Kelly! 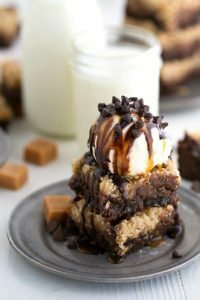 I love how simple this is – I never would’ve thought they could be no bake with those ingredients, I’ll need to try these! I love this recipe. It’s really simple. I can definitely finish eating those in one day. ummmm okay so Chelsea this is genius. What if you did this with other mixes? Like just add butter to a cake mix? Have you tried it? That sounds so good. THESE sound so good. Also, I can’t believe you’ve essentially given me permission to make and eat an entire batch of brownies within 10 minutes. You are cruel. Genius, Chelsea! I love how simple this is. 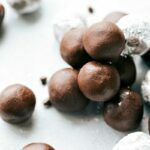 I’ve made my share of cookie dough truffles and things of the sort, but never have come across a recipe so yummy sounding with such few (delicious!) ingredients. I’ll have to try this. Pinning. Thank you so much Jelli! 🙂 Hope you are having a great week, and thanks for the pin! What a great dessert idea! 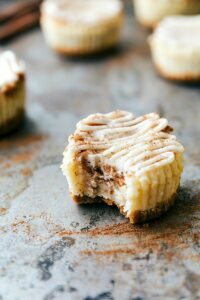 I am loving these and checking them out from the chef-in-training link party! Can you use apple sauce instead of butter as a binder? I’m not sure, since I haven’t tried it, but my first thoughts are it wouldn’t hold together or work. But if you try it I’d love to hear the results. Sorry I couldn’t be of more help! It depends on the size you roll them out to be. Anywhere from 20-30 balls of the brownie bites. I used coconut oil instead of butter though. And added two huge spoonfuls of organic peanut butter. Amazing! These sound wonderful, Just curious though about the texture, when eating plain brownie mix, it’s so granular, does that go away with the warm butter? I was wondering the same thing. 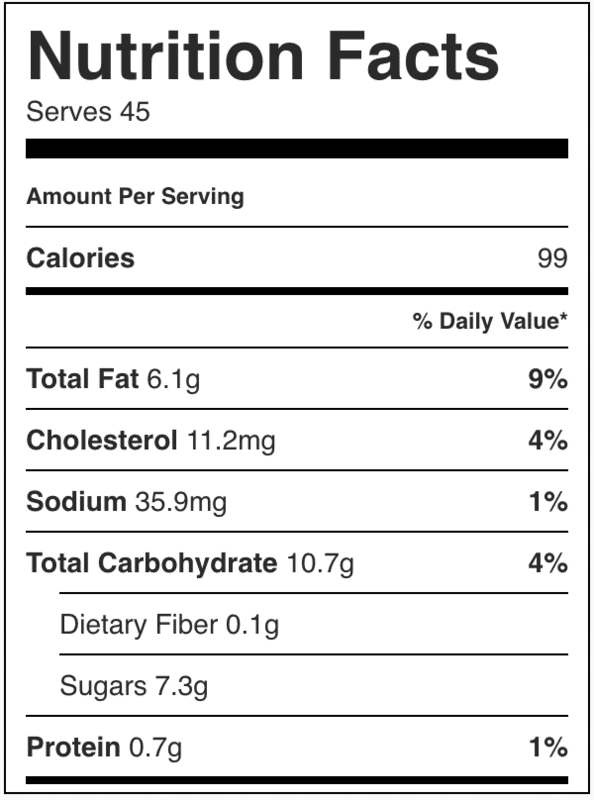 I’m not a fan of cookie dough for that very reason (granular texture). But I will try chocolate anything! It’s still a bit granular, but no where near as much as cookie dough in my opinion! I thought the texture of these were more like fudge. But if you don’t like the granular texture, I’m not sure if you would love these. Hope that helps! Yes, that helps! I think I will give this recipe a try. If it’s too granular for my liking, I can always add an egg, some flour, and vanilla to turn it into cookie dough and bake it. Thank you! I needed an easy dessert for a church social and these were a hit! I made them with butter and a little coconut oil since I didn’t have enough butter. They were so easy and yummy too! Next time I think I will add some instant coffee too! Definitely a great combo! Thanks for sharing the recipe! I have a question. Does the recipe really work, and do you thing it would taste good if i dipped it in melted chocolate and added sprinkles in top? I would never put a recipe on my site that didn’t work out for me. And sure I think that would be tasty. It will definitely make a dense and rich treat. I was wondering if I could use Fudge Brownie Mix. Do you think that woumd work as well? I made these today and they are AWESOME. They are so easy to make and SO DELICIOUS!! I put some pictures up on my blog and linked back here, thank you so much for the awesome recipe! SO great to hear you enjoyed these! Thanks so much for the comment 🙂 Love the pictures on your page on this recipe! 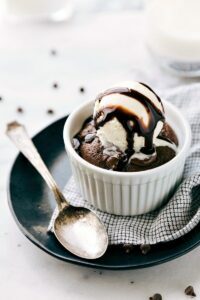 I like fudge like brownies, has anyone tried making these with coconut oil? I’ve made these a couple of times and they are always a hit. This time, I rolled them in sweetened shredded coconut. Delicious! IMO, these might have been tastier than the brownie batch! Thanks for all of your tasty recipes!! I made these with my cooking club at school, and it was perfect! We set out a mix-in/ topping bar of coconut shreds, more chocolate chips, crumbled graham crackers, candy cane dust, crumbled pretzels, and mini marshmallows, and they had a field day. They loved getting their hands dirty and customizing their own bites to keep or give as gifs. Thank you for this simple and fun recipe! What a fun idea to have all the toppings set up! 🙂 Thank you so much for sharing! I’m thrilled these were a hit Kirsten! Chelsea, these were a hit! I made these for a pot luck last week because I needed something quick after a failed cheesecake attempt. I ran out of butter, and substituted coconut oil for the rest. Rolled and dusted in powdered sugar…they were gone so quickly & it’s been requested that I make them again!!! I called them “truffles” and no one knew it was just brownie mix. Wow. A lifesaver for sure! I love it! What a great idea to call them truffles 🙂 Thanks for the comment Morgan!